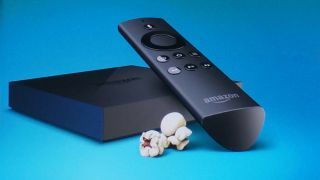 Amazon has proved the rumour-mongers right by launching the Amazon Fire TV streaming box to take on the likes of the Google Chromecast, Roku and Apple TV. The Amazon Fire TV box comes with a Bluetooth remote control, loads of partner apps (including Netflix) and also puts gaming front and centre with the option of buying a dedicated games controller. At an event themed to look like a living room and filled with movie theatre paraphernalia, Amazon's Peter Larsen took to the stage to unveil the device. After dissing the search function, closed ecosystems and lag on Apple TV, Microsoft's Xbox Live and the Roku box, Larsen took the wraps off the Fire TV. The little black box boasts smartphone-esque specs, including a quad-core processor, dedicated GPU and 2GB of RAM which Amazon says should make operation smooth and fast. There's also dual-band Wi-Fi on board, and a Bluetooth remote control that also features a microphone input so you can just talk into it to control the box. Searching on the Fire TV box will bring back results from all your streaming services - and Amazon says its voice search is the best in the biz. Streaming in 1080p is supported, and there's Dolby Digital Surround Sound via HDMI out too. As with most streaming services these days, Amazon's pretty keen on finding you new things to watch - the Fire TV predicts movies and shows it thinks you want to watch and queues them up so they start playing instantly (rather than making you sit through a loading screen). The device is designed to play nicely with Amazon's own Prime Instant Video streaming service (formerly Lovefilm Instant in the UK), and because the OS is based on Android there are already loads of partners on board including Vevo and Crackle - even Amazon's streaming arch-nemesis Netflix is present and correct. Amazon's looking to own the second screen too, with tablet integration telling you info about the actors in whatever you're watching and identifying the music playing too. Music services are coming to Fire TV next month as well, with Pandora, iHeartRadio and TuneIn on board. So that's film and music, what about gaming? Describing games consoles as too expensive and Apple TV's mirroring efforts as laughable, Larsen said, "With Fire TV we thought of games right from the beginning - fun immersive games at affordable prices." There's an optional extra of the Amazon Fire Game Controller, that will set you back US$40 (about AU$43.27) and comes with some Amazon Coins to spend on games (the average price of which is US$1.85, or AU$2.02). Amazon also gave a sneak peek of the first game it's making itself at Amazon Game Studios, Sev Zero. The Amazon Fire TV price is set at US$99 (about AU$107.09) for Statesiders, and it's available from today. No word yet on other countries, but we'd imagine that price will translate to AU$110 to AU$150 in Australia - if the box makes it across the Pacific.